Rick Whitted's Books | Rick Whitted | Your Personal and Career Mentor. OUTGROW YOUR SPACE AT WORK. How to Thrive at Work and Build a Successful Career. Nothing will destroy, delay, or diminish a career like impatience. Yet millions of workers quit their jobs every month because they haven’t gotten a promotion. It’s natural to want to make the most out of one’s career–after all, we spend more time working than any other activity in our busy lives. But the stark reality is that job-hopping in search of advancement and fulfillment may actually have the opposite effect. 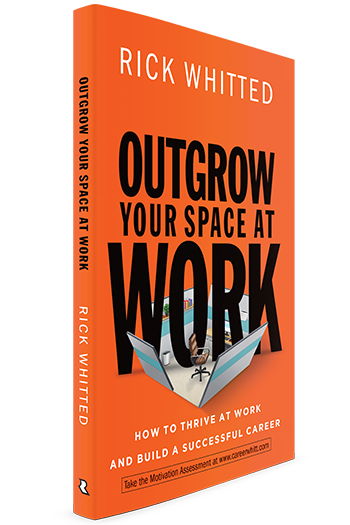 According to Rick Whitted, it’s about outgrowing your space–making your current job bigger and bigger until management gives you a larger role and increased responsibilities. With a lifetime of experience and research to back him up, Whitted shows readers how to address those things inside of us that prevent career progression–things like self-entitlement, the desire to skip steps, and pride–and instead pursue excellence right where we are. Readers will be challenged to identify why they want a promotion, define for themselves what success really looks like, make lateral moves that position them for promotion later, be innovators in the role they perform right now, and much more. End-of-chapter discussion questions help readers immediately apply concepts to their own personal situation, and three practical 30-day checklists.